The Google Auto-Complete game is fun to play. The game starts by picking a popular word. I picked Movies and then went down the list of letters in the alphabet. It was very interesting to see what pops up next. I have heard and seen that people play this game when they are board. But I started to give it some rules so that it was easier to play. First rule is eliminate locations or actually domain names. So for example for with the letter B, if Boston was first answer then it would be ignored. 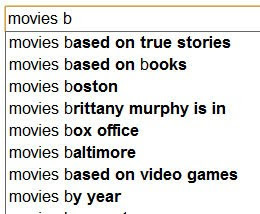 So the answer for Movies B, would be "Movies based on True Stories". The second rule is that is ok not to have an answer that is also a correct answer. So if the partner playing the game guesses, "nothing" it would mean that Google suggests 10 locations. The second rule is, compound words are not excepted. There must be a complete second word following. The third rule is, prompt your partner with how many words the expression is. So for example on the letter "A", the question is, "Movies A, three words?". Here is the whole answer list for "Movies". Movies just released on dvd. Movies kristen stewart has been in. Movies with a lot of sexuality. You may also play the game with two category words at the same time. The partner say two answers and it can apply to both categories. The game gets much each when you do this. Choose things that are similar like "Soccer and Football", or "Build and Construct". Let's play again with the words, "Dog and Cat" at the same time. This will be fun to see the overlap and the differences. Dog ear infection. Cat emery board. Dog food reviews. Cat furniture. Dog insurance. Cat in the hat. Dog kennels. Cat kidney failure symptoms. Dog leashes. Cat litter boxes. Dog obedience training. Cat on a hot tin roof. Dog the bounty hunter. Cat toys. Dog upset stomach. Cat urine odor remover. Dog xanax. Cat x ray. I hope you enjoy the game. Play with a partner or in a group. If you play often enough you will get the hang of it and it starts getting easier. You might want to give http://NameThatAutocomplete.com a try. Takes care of the dirty work for you.